Let’s cut to the chase. Sally doesn’t have a middle name. Her brother, Chef Sam Adkins, co-owns Sally’s Middle Name with his wife Aphra and they decide to call this out in naming their restaurant. I don’t know why this idea emerged, but the moniker is unique, memorable, and even smile-inducing. 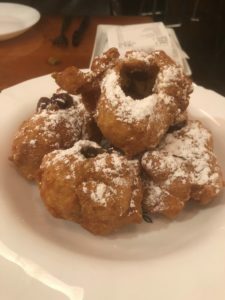 I had an enjoyable brunch at Sally’s Middle Name not long after the restaurant opened in 2015. 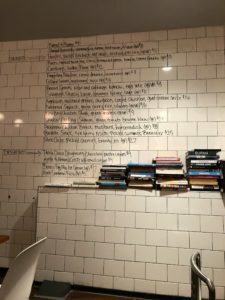 I’ve been meaning to return to the H Street, NE restaurant, but haven’t gotten around to it. And then I witness Sally’s chef de cuisine Miranda Rosenfelt knock out two chef competitors in the Capital Food Fight* in November, and that pumps me up for a return. There’s a lot to like about Sally’s Middle Name. The décor is clean and simple with white subway tiles lining the walls. The tiles, in conjunction with a mega chalkboard wall, do double duty serving as décor and as a vehicle for displaying the food and drink menus. The regularly shifting menu reflects a strong commitment to seasonal/local ingredients. Each dish at Sally’s Middle Name centers on a protein or vegetable that is punctuated by at least one unexpected ingredient. A sour or pungent component is usually in the mix. There are beets with smoked trout roe, cress, fermented green tomato, and crème fraiche. Collard greens are paired with mushrooms and miso. Shaved sunchokes are accompanied by parsley, red onion, and anchovy dressing. 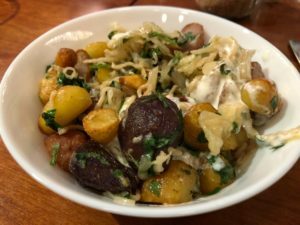 Fingerling potatoes tossed with crème fraiche are served over the ultimate sour ingredient… sauerkraut. It’s not exactly an intuitive combo, and maybe not for everyone, but I find it brilliant. Have brussel sprouts reached a saturation point? As long as chefs continue to create fresh takes, I’m going to keep eating them. 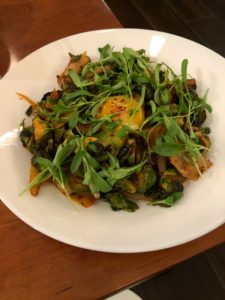 At Sally’s Middle Name, brussel sprouts are paired with pear and cabbage kimchi and fresh herbs, encircling an egg yolk. It’s another eclectic combo that surprises with its punch. Smoked Ora King salmon is nestled atop luscious green tomato beurre blanc. Flourishes of dill and capers join diced fermented green tomatoes in a demonstration of skill and attention to detail. Butternut Squash with green curry, rice, and cilantro knocks our socks off with its refined heat and pronounced tang. It’s a contender for our favorite dish here. Chef Rosenfelt’s winning dish at the Capital Food Fight was Old Bay pork schnitzel with green goddess dressing. Here its re-envisioned as New Bay Chicken Thigh with green goddess dressing. 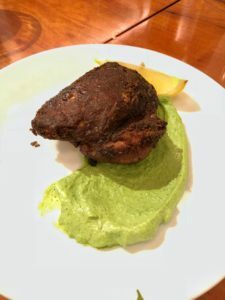 The chicken is coated with an in-house mix of 15 spices, inspired by Old Bay seasoning. The official judging may be over, but the feisty taste yields another victory. Pate a choux doughnuts filled with chocolate pastry cream make for a pleasant finale. The filling is unevenly dispersed, but this provides an opportunity for an entertaining game of hide and seek. 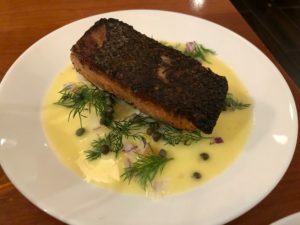 Some restaurants captivate me with a few stellar-sounding menu items, while others wow me with a full roster of dishes that appeal to my penchant for bold flavors and unique juxtapositions of ingredients. Sally’s Middle Name falls squarely in the latter category. The restaurant has an appealing intimacy and warmth, with amiable service that rounds out the experience. Sally’s Middle Name is a knockout on all counts. I can’t wait to return for round three.